AFP is following the top-ranked UVa. baseball team to the 2014 ACC Baseball Tournament at NewBridge Bank Park in Greensboro, N.C.
Editor Chris Graham will be on the scene at the May 20-25 ACC Tournament with live in-game blogs from the press box from the Cavs’ games on Friday at 7 p.m. against the winner of the UNC-NC State play-in game and Saturday at 7 p.m. against #4 Florida State. Virginia opens pool play at the ACC Tournament on Thursday at 11 a.m. against Maryland. Coverage will include postgame interviews with Coach Brian O’Connor and All-Americans and future top MLB draft picks Derek Fisher, Mike Papi, Nathan Kirby and Nick Howard. 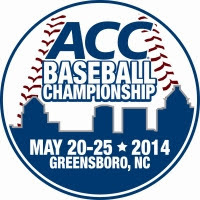 Your business can be the exclusive sponsor of AugustaFreePress.com coverage of the 2014 ACC Baseball Tournament with a Website takeover package running May 21-28. The $500 exclusive package will include …. Bonus features may include your logo on video segments, live mentions on any podcasts done during this time, frequent Facebook mentions and more. AugustaFreePress.com has become one of the premier sources for coverage of UVa. athletics. AFP traveled with the UVa. men’s basketball team to Greensboro for the ACC Tournament and to Raleigh and New York City for their run to the Sweet 16 in the NCAA Basketball Tournament. Join Augusta Free Press all weekend for coverage of UVa. baseball at the ACC Tournament. Let us know if this is something you have an interest in! This offer is first come, first serve and is EXCLUSIVE. Contact me today if you’d like to discuss! Contact us today at freepress@ntelos.net or 540.949.6574.